Amplitude Anxiety - Vibrate Software, Inc. Many years ago when I was a service technician at a Cadillac/Oldsmobile dealership, I occasionally worked on customer vehicles with vibration or noise concerns. No service technician ever wants to work on noise or vibration concerns because they are very difficult to diagnose (and there are much easier ways to make money in a shop). As the youngest technician in the shop I was often the unlucky guy who had to go for a road test with some old retired guy to listen for a noise or vibration. To me, it seemed like these old guys had nothing better to do with their time than drive around listening for noises or vibrations in their vehicles just to make my life more difficult. Many times the noise or vibration was so minimal that I didn’t even notice it until the customer pointed it out. I can remember thinking that I would not ever complain of a vibration like that; how am I going to fix it? 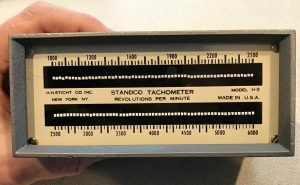 Back then we did not have electronic vibration diagnosis tools, we only had an old “Resonant Reed Tachometer”, and I was not even sure how to use it. Needless to say, there was a lot of tire balancing and parts swapping (guessing) on those vehicles in an attempt to cure their vibration concerns. Many times we could not fix the problem and told the customer that it must be normal. Today’s technicians have access to several electronic vibration diagnosis tools. In my opinion, the best vibration diagnosis tool on the market today is our NVH app for smartphones. Regardless of the vibration diagnosis tool you use, a common question you may have is “What amplitude level is considered acceptable?” As you may know, amplitude is a measurement of the severity or harshness of a vibration. Modern vibration diagnosis tools measure two things: vibration frequency (the number of shakes per second), and vibration amplitude. The amplitude level is typically displayed with a unit of measure of “G Force” or force of gravity. 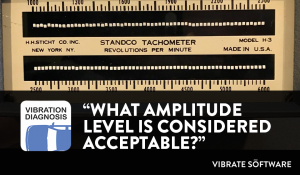 Severe vibrations have high amplitude levels and mild vibrations have low amplitude levels, so is there a certain level that is considered normal? The answer to that question is no, each customer may be sensitive to different amplitude levels. The old guy in the Cadillac from my service technician days was sensitive to a low amplitude vibration and he wanted it fixed. Had that been my car, I would have never complained about the vibration because my amplitude sensitivity level is less sensitive; the vibration didn’t bother me. So how do you use amplitude level as a useful measurement to help you? There are several ways. Record your road test amplitude levels before making any repairs to the vehicle. Make the repairs, road test the vehicle again and compare the road test amplitude levels to the previous ones. IMPORTANT: The smartphone must be placed in the exact same place for all road tests for the amplitude level comparison to be accurate. The closer you get to the source of the vibration, the higher the amplitude level displayed on the smartphone will become. The sensitivity level of the amplitude can be adjusted in the “Settings”screen of the NVH app, to you can make the NVH app even more sensitive when you get your own old guy (like me now) with a vibration concern. To summarize: there is not a set amplitude level that is acceptable to everyone, you must simply find out what it is while the vehicle is vibrating and reduce it with your repairs. You may not necessarily need to bring the amplitude level down to zero, many times just reducing it will make your customer so happy with you that you will be their “Hero”. They will tell all their friends about your skills resulting in additional business and profits for you! There are close to 300 possible sources of a vibration on a typical vehicle today. The NVH app eliminates the guesswork in vibration diagnosis and guides you step-by-step through the entire diagnostic and repair procedure. Get the NVH app today by clicking on the link below. THE NVH APP IS HERE! Turn your iPhone or iPad (Cellular Model) into an all-in-one Noise, Vibration, and Harshness (NVH) diagnostic tool! Purchase our new App to use the internal sensors of your iPhone or iPad (Cellular model) to diagnose automotive and truck vibration problems. There are close to 300 individual sources of a vibration on a typical vehicle, the NVH App knows each one of them and can guide you through the entire diagnostic and repair procedures for each one of them. What issues have you had with diagnosing vibration, harshness and noise issues? I have been helping educate Automotive Technicians for years. With millions of views on YouTube, I want to share my knowledge with you.